My name is Nicole Martin and I have been married to the absolute best man for the past fourteen years. We met in the 7th grade and have been best friends ever since. Before we ever knew we would be married, or even date each other, we talked about our desire to adopt — just never knowing it would be together. Today we have nine beautiful children — three biological children ages 13, 11, and 8 and six children through foster care and adoption, ages 10, 8, 5, 5, 3 and 1. We started our journey with Arizona’s Children Association in June of 2014 and by the end of October we were licensed foster parents. For me, it was a dream come true! Just a few days after our license was approved, we received a call for our first sweet little angel. She was a five-week-old, five-pound Native American beauty who flipped our lives upside down in the most beautiful of ways and today she is one of my very favorite people in this world. Before we knew what hit us, our lives changed in every way possible. Our souls were stretched wide open, our arms had held such sadness and breathtaking beauty with each child that passed through our home. Our story is kind of unique in how fast we adopted our first five kiddos. On the first day of our PS-MAPP training classes we were asked if we would consider fostering a sibling set. Our first response was out of fear and we wrote down our answer, “probably not.” It’s funny to me now, how God works in each of our hearts to prepare us for what He has in store. By the middle of our 11-week classes, my husband and I had both had a change of heart and knew we wanted to help keep siblings together. And wouldn’t you know it, four out of our six adopted children are biological siblings. Our last and final sweet angel came to us right after the adoptions were finalized for our first five. She is the biological sister to three of our boys and even though we had closed our foster care license, we knew we needed to keep siblings together if at all possible. So once again, we found ourselves with a newborn baby and for the first time in my life, I knew my family was complete. Foster care is not easy, it can be heartbreaking, it will shine a spot light on the cracks in our own foundations. It teaches us deep empathy, super human patience, the ability to love and extend grace to the biological parents, whom once we thought of as the enemy. But these kids in foster care will also teach you how resilient children are, how special each child is, whether they stay with you for a week or for a lifetime, their life and story will change yours forever. I firmly believe every child deserves a mail box with their last name on it, a parent or two running on the side lines cheering them on, someone they can run to in the middle of the night when they have had a bad dream, a dinner table to sit around and share the highs and lows of their day. Every child deserves a family, even if it is only temporary, it can be a time in their life to which they feel grounded and connected. I remember saying it and I’ve had many people say it to me: “There is no way I could love a child as my own and see the pain they have went through and then one day hand them over to go back to that environment.” It’s true, there’s no way to do it without a broken heart. That’s exactly the point! That’s what they need! We are to love these children as our own, knowing that they might leave us one day. But, they deserve it! I would much rather work to heal my own broken heart because I have loved a child within my family, than know a child went without a family. Our lives are busy, there’s always laundry to do, there is always a never-ending demand of hearing, “I’m hungry,” “Mom, can I have…?” or, “he won’t stop.” And, going ANYWHERE with nine children is a complete work out! But, I wouldn’t change a single thing. They are my people, and I am theirs, and there is no place else in the world I would rather be. I encourage each of you, if you have a tug on your heart to foster and/or adopt some of Arizona’s best, chase after it, you will never regret saying yes to a child. I promise. If you can’t foster or adopt, volunteer, if you can’t volunteer, donate. 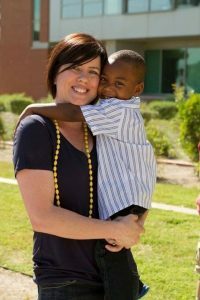 The children of Arizona need your support!